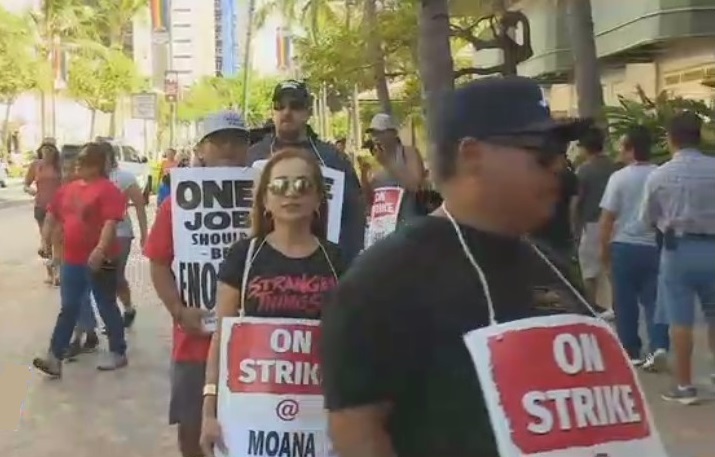 Chanting and cheering can be heard around Waikiki, emanating from the Waikiki Beach Marriott Resort & Spa as hotel workers strike for a second day in the land of Aloha. Representing just one-fourth of the Local 5 union, 2,700 hotel employees walked off the job on Oahu and the island of Maui yesterday and today. This strike could have a ripple effect throughout the Hawaii hotel industry, not just Marriott properties. It is meant to send a message to other hotel chains as contracts for 10,000 Local 5 hotel workers ended in July at all the major resorts. Members of other unions have shown their support for Local 5 workers by walking picket lines with them. Union members want not just a better hourly wage increase, they want job security. As artificial intelligence, robotics, and automation continue to move into the visitor industry work force, human employees are worried about their future ability to earn a living. Negotiations are ongoing and future meetings are being planned.